FC Barcelona are through to their eighth Copa del Rey final in the last decade -their fifth in as many years-, an achievement unmatched around the big European leagues. 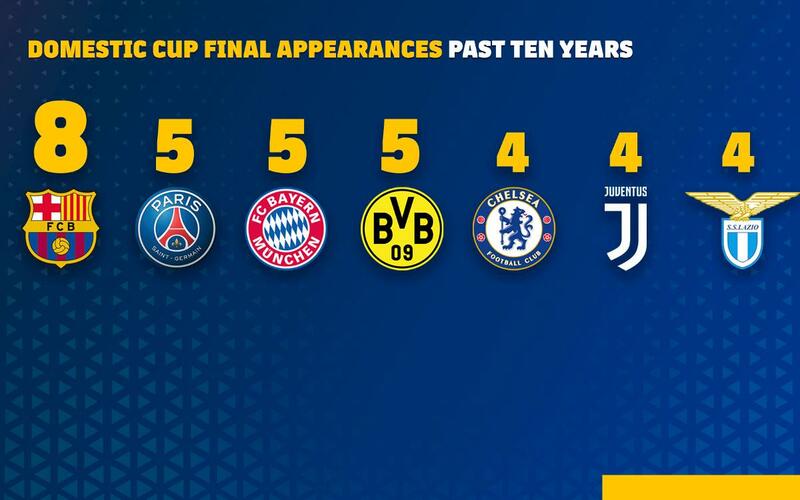 Bayern Munich and París Saint-Germain are the closest sides to matching Barça's achievement, with five cup final appearances in Germany and France, respectively. Borussia Dortmund have also been in five finals -including four in succession- but were eliminated from the German Cup by Bayern Munich this season. Some of Europe's most historic sides, such as Manchester United, Liverpool and AC Milan, have made it to the final of their domestic cup competitions just once in the past ten years. With their progression to the Copa del Rey final, Barça have got to more finals than any other Spanish side in the last decade. Real Madrid, Athletic Club and Sevilla have done so three times in the past ten years, and the latter side will be FC Barcelona's opponents in this year's final on 21 April.